HELLENIC PETROLEUM Group announced strong financial results, according to IFRS, with 1Q17 Adjusted EBITDA at €229m (+35%) and Adjusted Net Income at €126m (+80%). Benchmark refining margins remained at high levels and operational performance was improved in all Group activities. 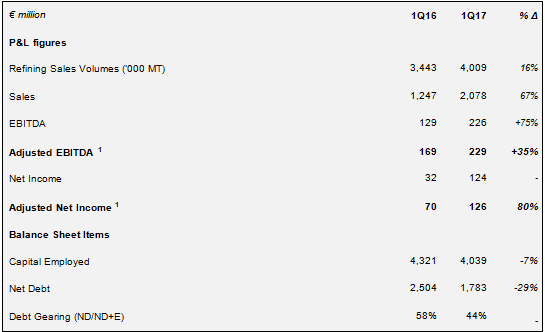 Improved refining operations led to higher production (+11%) and sales (+16%), with total turnover exceeding 4m MT. All sales channels recorded growth, with exports up by 18% at 2.2m MT and domestic market sales at 1.3m MT (+13%), reflecting strong heating gasoil demand and increased market shares. Crude supply optimisation also had a positive effect on financial results; the above led over-performance vs benchmark margins higher compared to previous quarters. Petrochemicals reported their strongest quarterly operational profitability, despite weaker benchmark margins, while Marketing recorded higher volumes and contribution to Group results. 1Q17 Reported Net Income amounted to €124m, vs €32m in 1Q16 (+287.5%), as reduced oil prices volatility in the first months of 2017 had a limited impact on inventory valuation. Implementation of OPEC’s decision to reduce crude oil production led to higher prices for most of 1Q17, with Brent averaging $55/bbl for the quarter, up significantly vs 1Q16. Macro developments and monetary policy in Eurozone and the US resulted to the further strengthening of the US dollar, with EUR/USD at 1.06, the lowest in the last 15 years. The notable strength of fuel oil cracks was the key driver of Med benchmark refining margins, with diesel crack also higher, while other products were weaker. Med FCC benchmark margins averaged $5.9/bbl, the strongest since 2015, with Hydrocracking at $5.1/bbl vs $5.4/bbl last year. Domestic fuels demand was up by 3% in 1Q17, with total consumption at 1.8m MT, due to colder weather conditions. Heating gasoil market was increased by 11%, while transport fuels were lower by 2%. The marine & aviation market was also higher by 26%, driven by bunkering demand. The implementation of Group financial strategy in 2016, with the new bond issue and the tender offer, as well as the improvement of financial ratios and debt covenants, was the key lever for balance sheet improvement. Steadily strong operating cash flows (Adjusted EBITDA – Capex) amounted to €211m, vs €143m in 1Q16, enabling better management of debt obligations and working capital. As a result, gross debt continued the decline reported in the last quarters, with a further reduction following the repayment of the outstanding 8% 2017 notes post 31st March. 1Q17 Net Debt was €1.8bn, flat vs 4Q16. Furthermore, finance costs in 1Q17 were 4% lower and are expected to further reduce during the course of the year. In E&P, the planned exploration works at Patraikos Gulf area continued, while the Lease Agreement for offshore block 2 (JV with Total – operator and Edison) is in final form and negotiations for offshore blocks 1 and 10 are in process. The Lease Agreements for onshore areas “Arta-Preveza” and NW Peloponisos” are expected to be signed in the next few weeks. HELLENIC PETROLEUM expects the singing of all agreements and ratification from the Greek Parliament in order to proceed immediately with the start of exploration works. Regarding the 35% indirect participation (through DEPA) on DESFA share capital, the Group in cooperation with the HRADF, is reviewing alternatives for the value maximisation of its participation. ­ Refining, Supply & Trading 1Q17 Adjusted EBITDA at €190m (+39%). ­ Production amounted to 3.8 million MT, on higher refining utilisation, with sales exceeding 4m MT and exports at 55% of total. 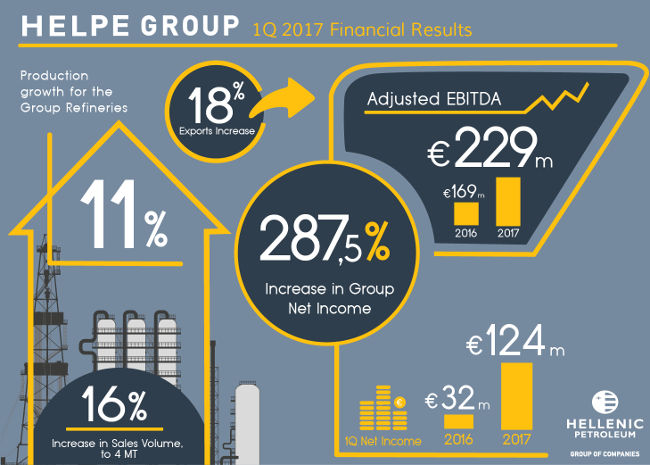 ­ Increased integration between Aspropyrgos propylene unit and Thessaloniki PP plants, as well as improved East Med products pricing, led Adjusted EBITDA at €28m, the strongest quarterly performance on record. ­ 1Q17 Marketing Adjusted EBITDA at €17m (+17%). ­ Domestic Marketing volumes were significantly higher in all markets, leading Adjusted EBITDA at €3m, vs €1m in 1Q16. ­ International Marketing sustained its profitability, with Adjusted EBITDA at €10m. ­ DEPA Group contribution to consolidated Net Income came in at €27m, due to significant demand increase from gas-fired electricity generators and other market segments. 1. Calculated as Reported adjusted for inventory effects and other non-operating items.